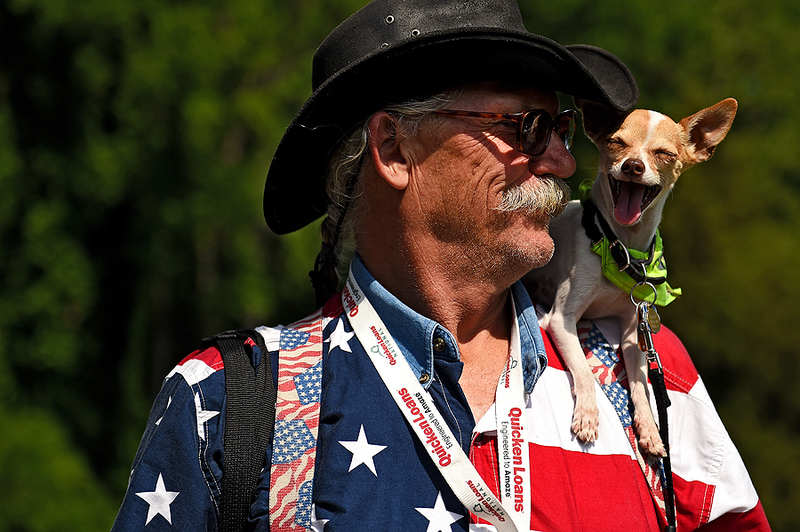 "Sam Daugherty, and his dog, Rocket J. Squirrel, pose for a portrait during the third round of the Quicken Loans National at Congressional Country Club on June 28, 2014 in Bethesda, Maryland." When I first began shooting pictures, I was very shy and timid of strangers. As I became more confident in my style, I found that I was passionate about finding more about others and building relationships with those in the community. Those I passed, whether on assignment or not, made me see daily life in a new light. One might pass the same person in the street every day and know nothing about their character. I remember waking one morning years ago and telling myself I'd never be afraid to talk to anyone or ask to make their picture - and at the same time - leave them with dignity and respect when posed. War veteran Sam Daugherty, and his dog, Rocket J. Squirrel, are two of the many that caught my eye recently and gave me a couple seconds to help share their story visually. This picture reminds me that people are willing to share their lives with others and continue to make my job incredibly special. 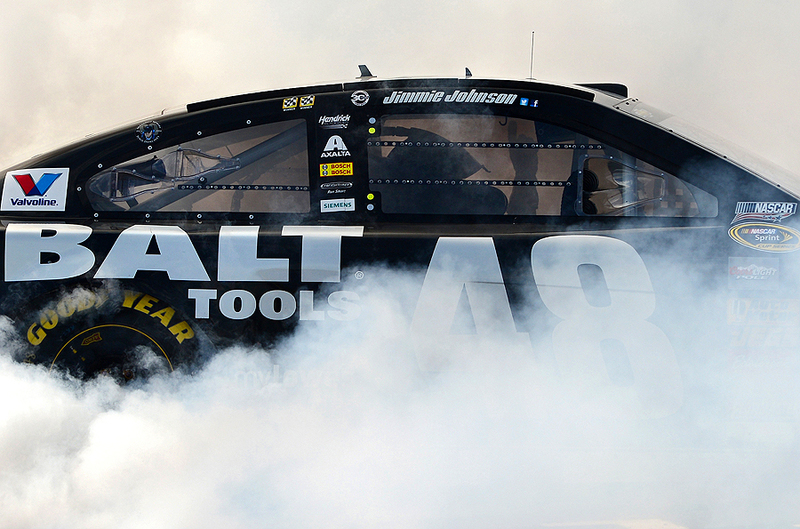 "Jimmie Johnson, driver of the #48 Lowe's/Kobalt Tools Chevrolet, celebrates with a burnout after winning the NASCAR Sprint Cup Series Quicken Loans 400 at Michigan International Speedway on June 15, 2014 in Brooklyn, Michigan." Last weekend, more than 40 drivers took the green flag at Michigan International Speedway with hopes of being named the next Sprint Cup Series race winner. While all of the drivers were looking to be a winner amongst their team, others were also hoping to be in the spotlight with their family, as the number one Dad. The Quicken Loans 400 raced on Father's Day and it was fun to document the drivers and their children in the garages and on the grid. These are the type of moments I am always looking for away from the action - as these iconic heroes behind the wheel display humility when with their young-ones. At the end of the day, with risk comes reward, as Jimmie Johnson proved for this year's Father Day that he was the best - gaining his first ever Michigan win and putting smiles on his family's faces. 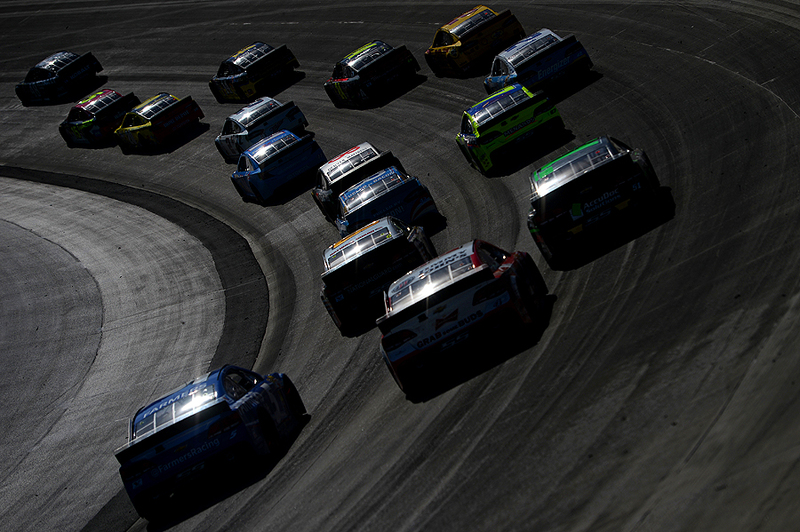 "Jimmie Johnson, driver of the #48 Lowe's/Kobalt Tools Chevrolet, leads the field during the NASCAR Sprint Cup Series FedEx 400 Benefiting Autism Speaks at Dover International Speedway on June 1, 2014 in Dover, Delaware." The hardest part about being a photographer is seeing the same venues in a new light. Of all the NASCAR tracks I've photographed in the past couple of years, Dover is one of those tracks I've seen the most only because of its vicinity to my home. Ironically enough, even with three series of racing occurring in a single weekend there each time, I still haven't shot from every position. I had fun seeing the track in a new light as I was able to do a little bit of roaming in turn one and two this time around. 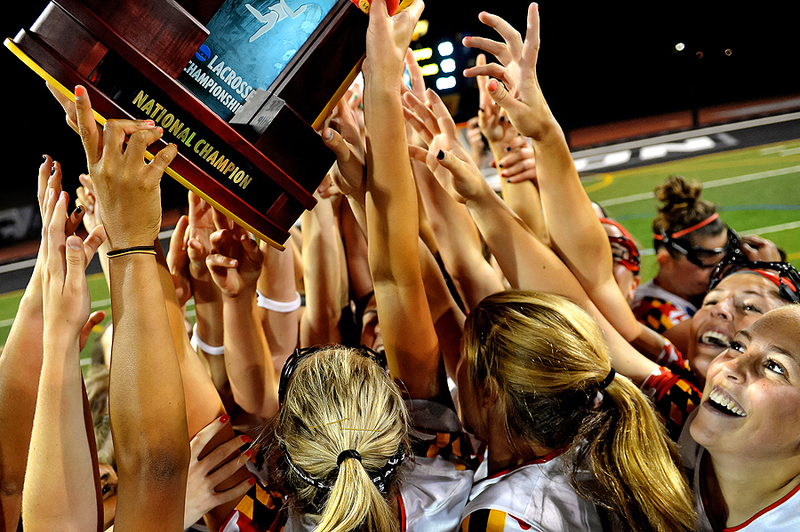 "The Maryland Terrapins celebrate after defeating the Syracuse Orange in the NCAA Division I Women's Lacrosse Championship at Johnny Unitas Stadium on May 25, 2014 in Towson, Maryland." Everyone loves a championship - from the fans, to players and teams, and of course, photographers as well. Having grown up playing multiple sports, and still playing today, I continually compare my life to sports. I believe sports prepare those who play them for life's moments - the thrill of victory and the agony of defeat, functioning with interpersonal relationships, practicing and performing a skill, working alongside others, and much more. 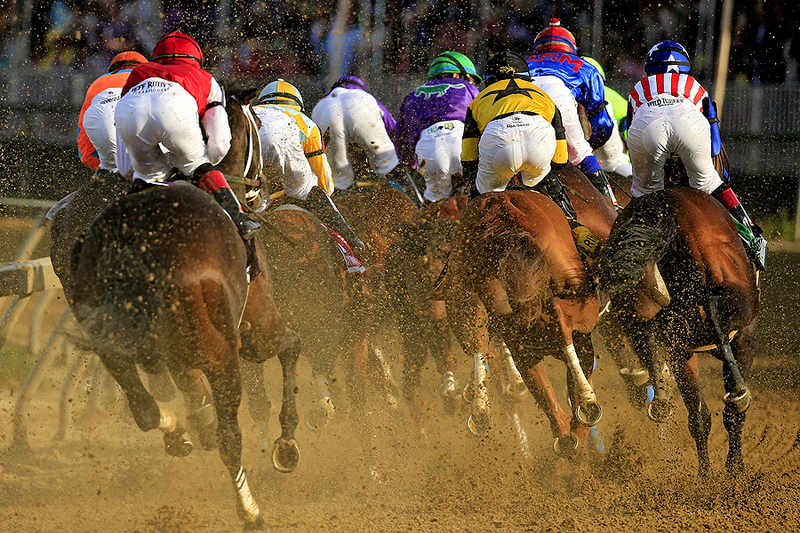 Documenting a championship is all of those things and more put on display - but in short is formulating a game plan to see who comes out on top one last time. For the NCAA Division I Women's Lacrosse Championship, the Maryland Terrapins got to celebrate after defeating the Syracuse Orange. To rise that trophy above their heads has to be a special moment - and it's apparent that they all wanted to feel the win by getting their hands on the iconic trophy they'd been chasing all season. "A deer head hangs out of the John Deere #265 car, driven by Shawn Bagnall of Millersville, Pa., during the Memorial Day Spring Crash At The Buck at Buck Motorsports Park on May 24, 2014 in Quarryville, Pennsylvania." One of the best things I ever learned to do when I was first starting out was to find feature pictures. No matter where I was working at the time, I was continually sent out to find something interesting in the community. Some days I only drove for a couple minutes before finding a compelling subject. Other days I stressed and feared of not finding anything before eventually stumbling across something. Whether it was an easy hunt or not, it has been one of the most rewarding skills I ever developed - being able to find and make something of nothing. To those that aren't in the business, it might sound easy, unless you're doing it multiple times a week. Ideas run out quickly and you're forced to be creative, talk to strangers and know what's happening in your town and surrounding communities - all in order to return with a candid, eye-catching moment. 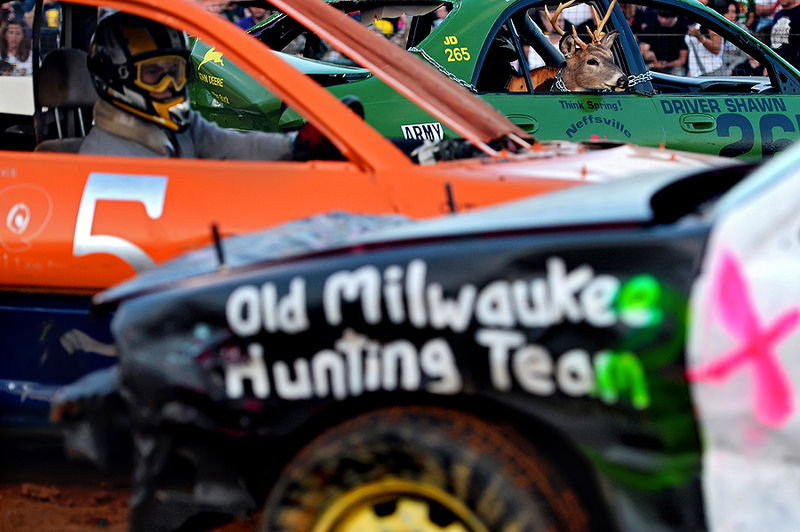 Recently, driving through Pennsylvania, I stumbled across a demolition derby. Curious, and with time to spare, I introduced myself to the owners, who graciously allowed me to photograph the event. I spent less than two hours playing around, including: talking to the drivers, working on my skills, and trying to find a interesting picture. It reminded me of past feature hunts and I left there refreshed remembering that even the small events can present interesting pictures.